Oops, sorry. Wrong philosophy class. We're talking computer software here. Okay, let's start over. If a tree falls on your favorite coin-op arcade machine and destroys it, what are you going to do? Yeah, I know it's a crazy question, but remember we're talking philosophy here. Philosophy is all about crazy questions. Most of the time they can't even be answered, so we're ahead of the game here because I'm going to answer this one: If your favorite arcade game happens to be Out Run, then buy the ST version recently released by Sega and distributed by Mindscape. It is one of the most accurate translations of a coin-op you're likely to find for any personal computer. Ah, but—and here's where we get into the really deep philosophy, folks—that raises two new questions. How accurate a translation do we really want for our STs, and how much should we expect to pay for it? Don't expect me to provide definitive answers to those questions. I can't do all the work for you. But, as Jed Clampett might have said on The Beverly Hillbillies, I will commence to do some philosophizing. Like other driving simulations, the object in Out Run is to get from Point A to Point B by completing intermediate stages within the time allotted. Seems to me the money question isn't too difficult. Think about how much you like a particular coin-op, try to figure out how many times you've already played it and guesstimate how many times you might play it if you owned it. If you multiply that last number by 25¢ and come up with a figure that's more than the going price of the home version, seems to me you might want to run right out to your nearest software retailer and pick up a copy. If all your calculations were correct, you'll probably consider your investment a reasonable one. But that doesn't necessarily mean you'll be totally happy with the program. You see, that would contradict a philosophical theorem that was formulated not long after the first Pong video games found their way into homes all across the country. The theorem states that it's impossible for a video or computer game to ever completely satisfy the person who buys it. We always expect a little more. And, unfortunately, the ST version of Out Run simply doesn't deliver. As close to the orginal as the ST version is, the tens of thousands of video-game fanatics who fed countless quarters into the Out Run coin-op will probably want more than just a faithful translation after they've played the home version a few dozen times. To start with, they might want an instruction manual that's got a little more information in it. The one provided is a bit on the sketchy side. Fact is, if you eliminate the page of instructions that explain how to load the program on three different computer systems, it contains little more information than you'll find pasted to the front of a good arcade stand-alone. I did appreciate the page containing a chart-type map of the Out Run course. The timing, scoring and tips section was also appreciated, although the directions explaining how to register high scores were incorrect. Another waste of space was the labeled photograph of the game screen. I can't imagine anybody being unable to figure out everything about the screen simply by playing Out Run one time. These minor flaws in the documentation could be ignored if the instructions were otherwise complete. But they're not, if for no other reason than they fail to thoroughly explain the drop-down option menus in the ST version of Out Run. For example, one of the menus contains an option called "Continue." There's no reference to it in the instructions, and I simply couldn't figure out what it's supposed to do. What I wish it would do is give me the option of continuing a game from the point at which it normally ends. But I couldn't figure any way to do that. Like other driving simulations, the object in Out Run is to get from Point A to Point B by completing intermediate stages within the time allotted. On the coin-op, you know you're going to have to drop another coin in the slot and start back at the beginning if thime runs out. But I've always felt that purchasing the home version of an arcade hit should entitle the customer to be able to play a game out to its conclusion. And since few of us are skilled enough to beat even the simpler arcade games, that would require a real continue or resume option that Out Run seems to lack. It's a shame because, like the coin-op version, the ST program is an enjoyable, addictive game. Animation is smooth, creating a feeling of real movement as your sports car cruises over dips and curves in the blacktop, and roadside scenery flashes past. Occasionally, you'll notice a little glitch in animation (usually when passing another vehicle), but mostly the visual effects are first-rate. Playability is also first-rate. 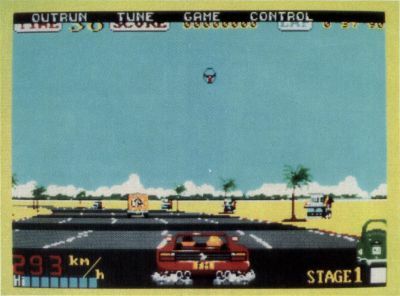 Out Run can be played using either a joystick or mouse, and response to input from either device is quick and accurate. Moving the mouse or joystick left or right steers the car, and the fire button or right mouse button shifts between high and low gear. Holding down the left mouse button or pushing the joystick forward makes the car accelerate. But even when using a good stick such as Mindscape's Powerplayer, negotiating-turns and regulating your speed is a little tricky with a joystick. Finally, Out Run gives players the option of listening to any one of three tunes (or no music at all) while tearing down the highway. All three songs are catchy and seem appropriate for the fast-paced on-screen action. 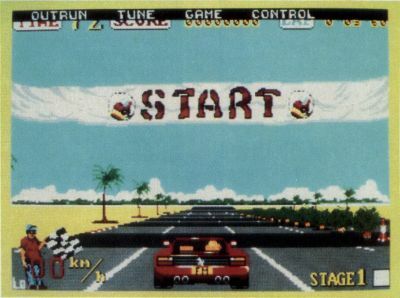 If you like fast-paced driving simulations or fine yourself drawn to the coin-op version of Out Run, you'll undoubtedly enjoy Sega's ST translation. You'll have to play it at least 200 times to justify its asking price, but that's not an unreasonable expectation for a game that looks and plays as good as this one. It's just a shame that the designers didn't add features that could have given it an even longer play life. If you like fast-paced driving simulations or find yourself drawn to the coin-op version of Out Run, you'll undoubtedly enjoy Sega's ST translation.